If you’ve recently attended any supply chain conferences or spoken to any consulting advisors, the buzzword of the day is all about digitizing the supply chain. But after years of digital implementations, the payoffs have stayed elusive. 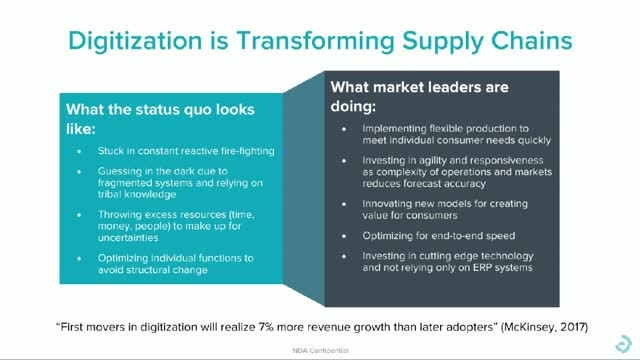 The problem is that most digitization efforts start with a functional focus, but supply chains are by nature multi-enterprise. Realizing the benefits of digitizing your company’s end-to-end operations requires an “all or nothing” mindset. But all or nothing doesn’t have to mean all at once. It’s normal to want to start with a more controllable project, but how do you do it? - How getting started with one product line or business unit will enable a horizontal approach that connects across functions and partner ecosystems to create a blueprint for successful digitization. - Case studies and real-world ROI of successfully digitized supply chains. How can you stay ahead of the everyday problems, such as why production is delayed, why shipments are late or why customers have yet to receive their orders? Despite the ever-growing volume of data swirling around the supply chain, companies are still adding systems on top of systems, forcing supply chains to become siloed both functionally and technically, which is formalising the isolation of data and leaving the gap between plan and reality unaddressed. In this webcast, our industry speakers will look to discuss the best practices and tools available to reduce the impact of actual or potential supply chain incidents by utilising data that relates to products, processes and people in the supply chain.